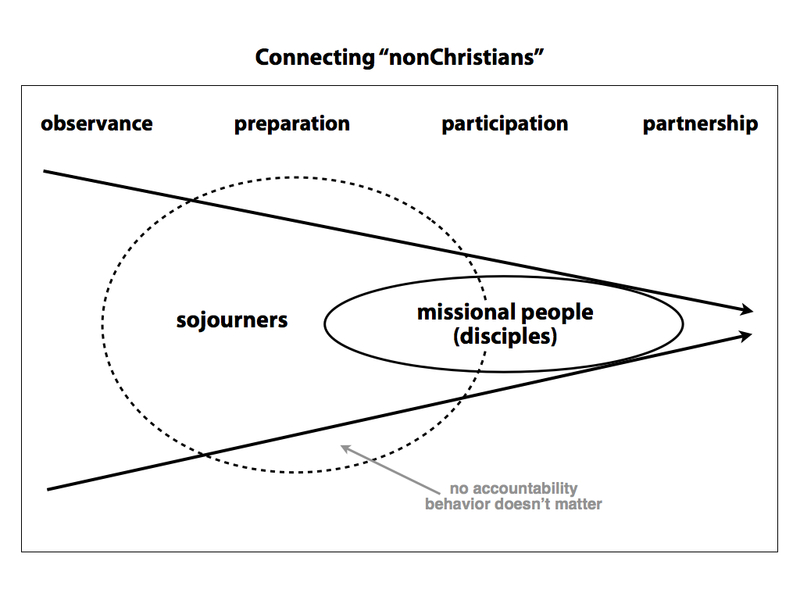 So my first takeaway from the Missio Intensive conference, which has taken me five posts to work through (here, here, here, here, & here), has to do with how we define and organize the church on a big picture meta- level. My second takeaway was the amount of thought they put in and structure they give to the process of assimilating new folks into these missional church communities. In other words, they are very intentional about how people join their church. We’re finally recognizing that the church is weird, and as such people need to learn and experience what we’re all about before deciding whether to become part of our family. The old-school term for this is “catechism,” and it’s an idea I’ve long been saying we need to revisit. Catechism has been a core practice of the church since the early days, and I’ve blogged some about it in the past. They’ve divided out the process of joining their church into four parts; the first three have definite stopping (almost “graduation”) points, whereas the fourth has no preplanned end. During the observance phase folks are . . . wait for it . . . observing. They begin by just kind of casually checking the place out. This typically lasts 2-3 months, during which time various opportunities are taken for a person to hear and learn Adullam’s story, as well as for Adullam folks to learn the person’s story. This isn’t like a we’re-gonna-grill-you interview process, but there is definitely intentionality involved. Whenever the person feels ready to take the next step, they attend a quarterly “Welcome to Adullam” class where they receive more in-depth sharing about how Adullam works and what it would mean to be part of this community. This is a “call out” experience where folks are given the chance to up their commitment and begin the official process of joining. Here they enter into the preparation stage, which also lasts 2-3 months. They lead people through a wonderful group-based resource called the Tangible Kingdom Primer. The primer takes them through a daily journey of learning to live life in the kingdom of God. They receive teaching and undertake tasks, all in the context of community. Obviously they can bail whenever they want, but those who make it through and want to continue are publicly “sent” via a prayer of blessing to become almost-full participants. 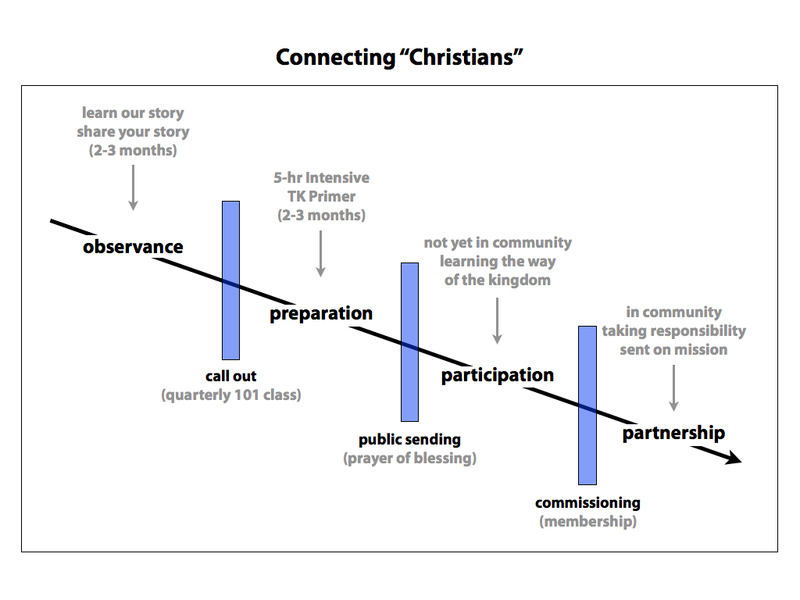 During the participation stage people are not yet fully in (what many would call “members”) but they are experientially learning how to live together in the way of God’s kingdom. I believe they include this stage so that people don’t get all excited and over-commit themselves before they realize what is involved, which saves both them and the community as a whole. This lasts as long as it needs to, and ends when the person either peaces out or decides to go all in. At that point they are partners who commit to a kingdom-based way of life in community. They are commissioned as full members of Adullam. Importantly, now is when they take on responsibility for others in some capacity, and are sent out on mission in every area of their life. The key to note here is of course the two circles (or ovals). The defined circle is the folks who make up Adullam – those who have committed to Jesus and life together in the church. But partially overlapping this group is a much larger and more porous group of folks who are journeying with them. This may be nothing more than someone who comes to a neighborhood party and eats all their food. And this is waaaaay more than just being nice to visitors who come to church. They’re operating on a completely different wavelength. They have taught their people that they are the church so wherever they go God’s kingdom is tangibly present, so this circle includes anyone they have regular interaction with at all: neighbors, coworkers, baristas. When they started Adullam, everyone simply sought to make 50 friends, and they define “friends” as people who invite you to hang out with their friends. They were not awkwardly waiting to slip in a Romans Road gospel presentation; they were just living and loving like Jesus and following the Spirit’s lead. They are not as concerned with defining the stages in this context, and note that they do not try to manage people’s behavior until after people have committed to Christ. So there you have it. This post has gotten long so let me wrap it up quick. Whatever you think of their particulars (as I have explained them), what these folks see rightly is that we cannot assume the same minimal distance between typical non-church folks and the way of Jesus. (Really we never should have, but that’s another story!) The life we live is weird because the God we worship is odd, and our tactics for helping people join in what we’re doing should reflect this. We can’t ignore then gap that exists between live outside God’s kingdom and life inside it, and we can’t underestimate the amount of hard work it takes to move from one to the other. Hard work to be a disciple? Now there is a novel idea! Yes, we need to take many things more seriously, kind of like we do our sports. And it starts at home.